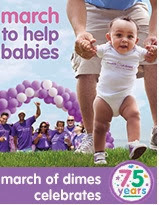 The March of Dimes March for Babies will be in Columbia, SC on Sunday, November 17, 2013. I am walking on a team in memory of my third grandchild, Braden. I, and my family, are not big on fund raising. We have never pushed hard to collect money or ask people for funds. I believe there's adequate information online for people to choose what charities to support and I like to let them make their choices without my advice. Having said that, I want to let my readers know that this walk is coming up. There are many ways to support the March for Babies. If you want to sponsor me, visit My Page to make your donation. If you've lost a baby, you can share your story. Thank you for your support of whatever charity you support. We are a generous nation.